Højbro Plads is a majestic and distinctive urban space, with the Absolon statue as landmark. 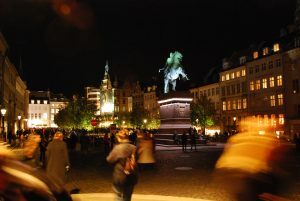 The new lighting in 2008 gave the square an aesthetic boost. The trees in the square are illuminated from below and closely aligned with the green leaves and brown tree trunks. The Absolon statue is now illuminated and the historic gas lights bring the mind back to another era. Experience Højbro Plads and Absalon and notice the lighting that creates the mood of the square.